anything unique or special about changing the impeller? First time on this boat…just curious. Put 100 hours on it last year. changed oil and fluids last fall but didn't change impeller. I've got to do mine this spring as well. I'm planning on getting a Globe. I'm going to use the wd-40 and bump the started method. Pull the 2 q1uick release pins on the engine cover hinges. Remove the engine cover. Then you can kneel on the swimstep, almost see what your doing & get both hands in there to do the job. Makes it a lot easier, no matter what extraction method/tool you use. You beat me to it. This is exactly what I did. I use 2 paint can openers to pop it out. I'll give credit where it's due.... greg2vlx showed me that. Such a stupid easy way to make it easier. I would recommend wearing a long sleeve shirt IIRC. And you can rest your head on the top of the motor and just feel your way around. Here is what mine looked like last spring. Did you find the rest of it? Surprisingly no. Nothing in the trans cooler, which shocked me. Not so much. I ran it on the fake a lake with no cooling issues, but once I dumped it in the water the temp started rising. Fortunately I had a spare. How old was that ate up impeller? bump the starter to jar the impeller loose from spindle? use the paint can openers on the cover or the actual impeller? Yes on bump the starter to jar the impeller loose. And use the paint can openers to hook the back of the impeller & pull it out of the housing. As for the cover, it usually comes off pretty easily. You might carefully use a knife or flat blade screwdriver if it needs some coaxing. Just be careful to not damage the gasket. Alternately just use an allen wrench on one of the pump mounting bolts to turn the engine a 1/4 turn or so. Doesn't take any effort. Bill - do you reuse those gaskets? Not sure. From the previous owner. The cover has usually come off pretty easily for me. So I was able to re-use the gaskets. Just depends on how good a shape they are when it comes apart. finally got it done this afternoon. was REALLY tough to pull out. 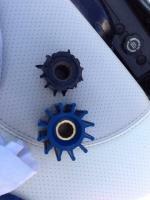 Impeller was in good shape. Just a couple cracks here and there. Makes me feel like the boat was well maintained. Putting the new one in was really easy. Used a bit of Vasoline on the impeller. Is that bad? HA! Screws and gasket installation were a breeze compared to removing the old one! Yes, it is actually bad to use vasoline if it was a standard impeller. Should use the glycerine packet that should have come with it or dish soap. If it was a globe, then it depends on what their directions said - the standard ones say specifically not to use petroleum jelly. Petroleum jelly is supposed to make the rubber deteriorate faster. I have no idea personally. The Globes seem like they are kind of slimy anyway, so I've never used anything to install them. I'd imagine that anything you put on the impeller would wash off after the first use. You'll be fine.